We have prepared a special giveaway just for you this CNY! Join us at the exciting Marina Bay Carnival on 15 Feb 2019 where you and your guest get to enjoy UNLIMITED rides for FREE! Let’s #MakeCrazyMemories together! On 8 Feb at 6pm sharp, the RSVP form will open for registration. Each winner gets to bring along one guest, i.e. 2 tickets in total. As parking spaces are limited, we recommend you take public transport so you don’t get caught in traffic and can really enjoy the 3 full hours of unlimited fun rides! Thank you for driving with us. And here’s to a better year ahead together! Exclusive to Hitch Club Go-Getter drivers only (determined as of 4 Feb) and limited to 1 registration (2 tickets) per user. 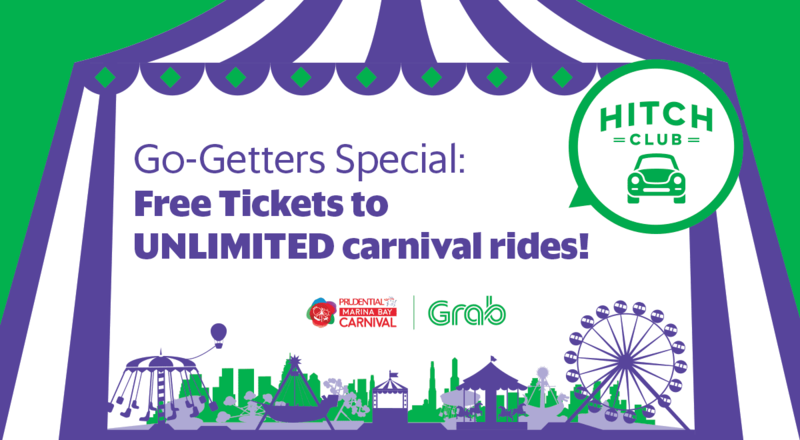 Each ticket entitles you to unlimited rides at the Marina Bay Carnival on 15 February 2019, from 4-7pm only, so ensure you can make it for the day before signing up. Do note that you may be blacklisted for future events should you RSVP and not turn up. Tickets will be distributed in pairs, and are non-transferable and non-exchangeable for cash or points. Both your Identification Card and the confirmation SMS are required to be shown in-person at the ticketing counter for verification. Congrats to the first 100 Go-Getter_Carnival-Giveaway-Winners! You would have received an SMS confirmation from us on 11 Feb. Seeya there!